TrailerWare’s wall protector kits will reduce dings, rubs, and scuffs, and help cushion your race car and other items in case of an impact. Easy to install! An impact absorbing, 1/4" thick foam insulated barrier that looks and feels like carpet. Protect the inside of a trailer--and its contents--with the a TrailerWare Trailer Protection Kit, the newest addition to Summit Racing Equipment's selection of trailer gear. 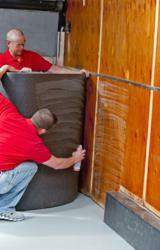 TraileWare is an impact absorbing, 1/4" thick foam insulated barrier that looks and feels like carpet. It’s stain resistant and stands up to harsh chemicals, oil, and water. Clean up is easy; sweep it, vacuum it, or hose it off—the material is mold and mildew resistant! The TrailerWare Trailer Protection Kits include the cover material, all necessary mounting hardware, trim, and adhesive. TrailerWare is available in four sizes: 10-14 foot, 15-24 foot, 25-28 foot, and 29-32 foot.